Another cringe-worthy defensive performance cost us after we came back from 2-0 down only to once again throw away points. Admittedly the home side dominated most of the game and we hardly had a look in for the first 30 minutes or so. They completed destroyed our shaky defence in less than a minute to give themselves the lead. Dante fired forward a long ball to Julian Draxler who was in an offside position but for some reason Niklas Süle attempted to clear but could only knock the ball on thus bringing Draxler into play. 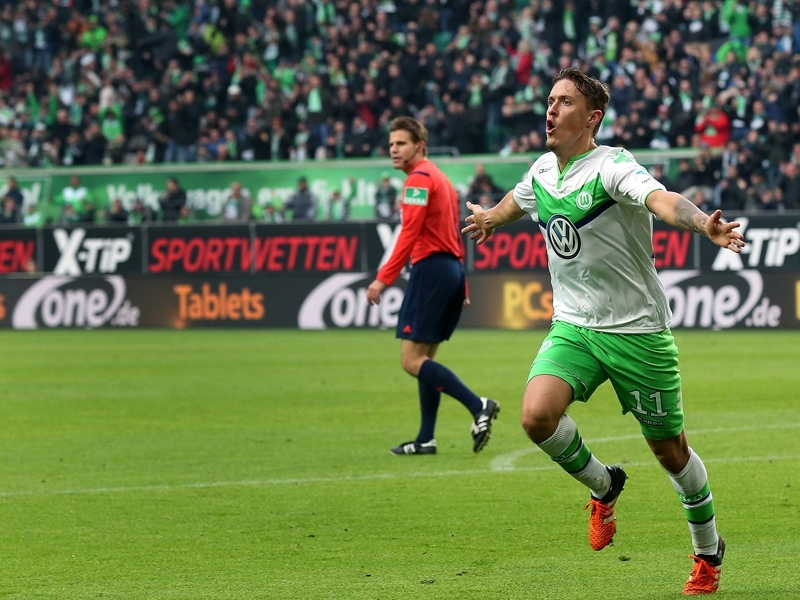 The German attacker sped forward before sliding it across for Max Kruse to fire into an almost empty net. Draxler was also involved in the second only six minutes later when a cross from Christian Träsch found its way to the former Schalke man and he crossed in for Bas Dost. Dost had managed to exploit our defensive weaknesses and found himself in space inside the box having dropped off from Ermin Bicakcic. It seemed then that we were done and dusted but somehow and from nowhere we managed to start a fight back. 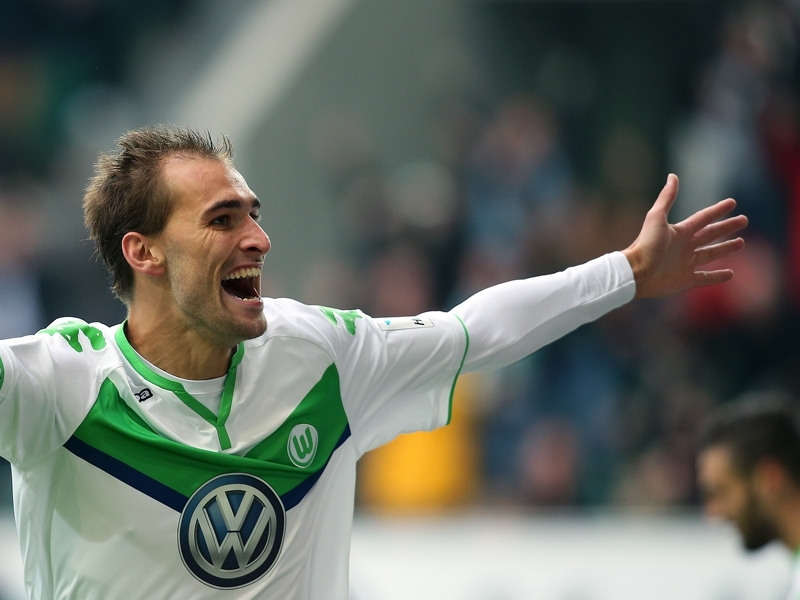 Dost celebrates the Wolves’ second of the game. Pavel Kaderabek was brought off after 22 minutes for Kim Jin-Su forcing Jeremy Toljan to switch from left back to right back. This move turned out to be a stroke of genius from Markus Gisdol as Toljan made a lung-bursting run down the right-hand side and was found in space by Eugen Polanski. He drove forward into the box and instead of sliding it across goal to Kevin Volland as I was shouting at him to do he decided to go it alone and produced a composed finish to get us one back. Ten minutes after the restart the fight back was complete when Volland on the edge of the box poked the ball forward for Jonathan Schmid whose initial shot was blocked by Diego Benaglio (ex-TSG keeper Koen Casteels was on the bench) but he managed to squeeze the rebound in at the near post. Toljan and Polanski celebrate their work for our opener. Despite being second best for the whole of the game so far we had managed to get ourselves level which made the loss all the more frustrating as we once again gave up two soft goals. The first came eight minutes after our second when another ex-TSG man, Luis Gustavo, found Kruse in acres of space inside our box and he had no one within a two metre radius when he found the back of the net. He completed his hat trick in the 83rd minute when Wolfsburg broke forward quickly as we chased an equaliser. Süle seemed to have Kruse covered but fell asleep allowing him to gain room and produce the best of his three finishes. Kruse celebrates the completion of his hat-trick. Onwards to tonight’s game against HSV which is now a must win as go into this round of fixtures sitting second to bottom with only Augsburg in possession of a worse record. Fighting back from 2-0 down after seemingly being down and out. Oliver Baumann had great game despite conceding four goal which were thanks mainly to the defence. Front three continue to look dangerous. Süle has so far not been close to the player he was before his ACL tear. The midfield were unable to take control of the game. Defensive lapses once again cost us, Bicakcic losing Dost for the second goal for example. 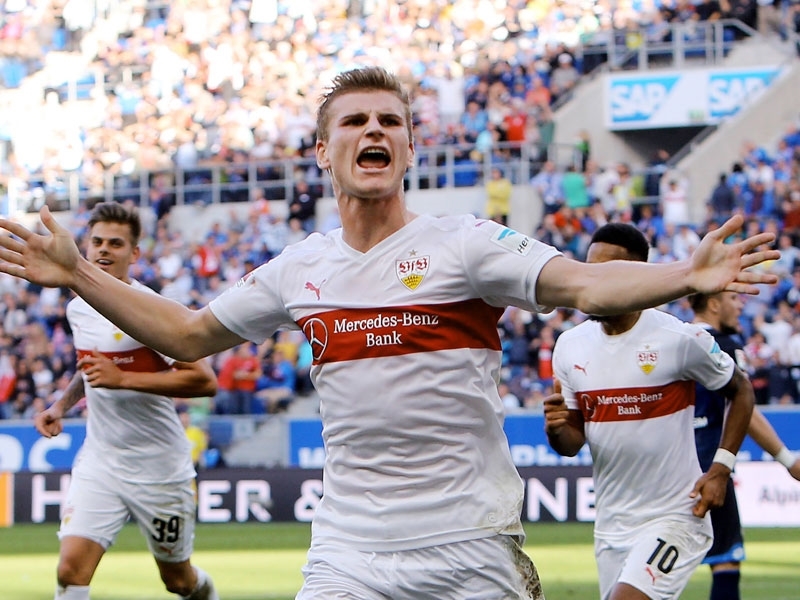 Kevin Volland continued form wasn’t enough in the end as Timo Werner was left unmarked in the box late on and he earned Stuttgart the point. After a recent upturn in results I was hoping we would be able to prolong our good form and come away from this game against a Stuttgart side who, like us, have only one win to their name this season. We nearly got off to a flying start after Eduardo Vargas, who has been brilliant recently, flicked the ball on for Ermin Bicakcic but the Bosnian could only strike the post with his effort. After that early close call the game settled down before Hoffenheim took the lead in the 33rd minute thanks to more great work from Vargas. He beat a couple of players before feeding Pirmin Schwegler who poked it past Toni Sunjic only to be brought down inside the box. Volland stepped up and, after only scoring his first Bundesliga penalty against Augsburg, made it 2 from 2 sending Przemyslaw Tyton the wrong way. 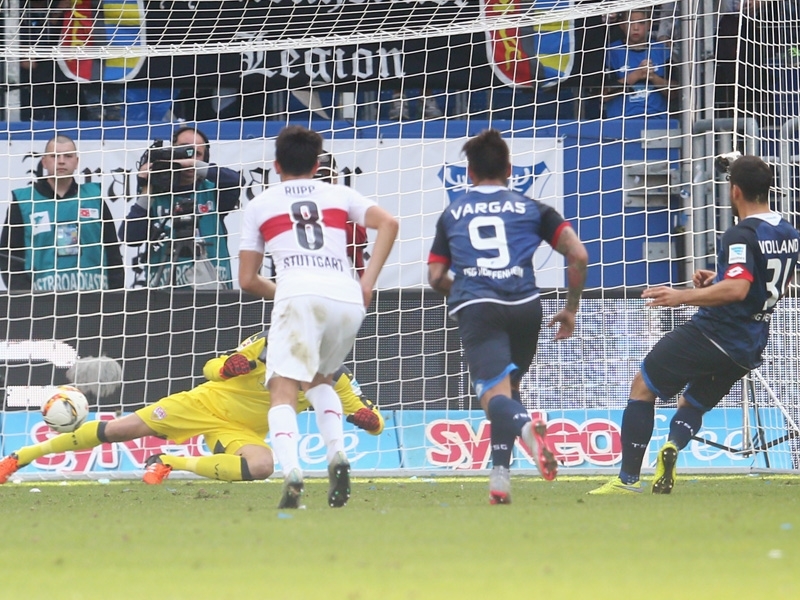 Volland scores his second penalty in two games. For only the second time this season we went into half time without conceding a goal and things were looking good. However, just after the hour mark Stuttgart brought on three players at once which seemed to cause some confusion in our ranks as only one minute later they equalised. Daniel Didavi sent in a nice ball from the corner and Jan Kliment managed to get some separation between himself and Eugen Polanski to head home. Another corner would turn out to be Stuttgart’s downfall as we broke quickly and when Vargas fed Volland the ball it seemed as if he was in only for a superb last-ditch tackle from Serey Die to poke the ball away. But there was more to come. Tyton had come out towards the ball just before Die made his tackle and as the ball was forced away both Volland and Tyton chased after it. When it became clear that Volland would get there first the Polish keeper attempted to back track but slipped allowing Volland to spin and chip the ball over the helpless Tyton. When it seemed as if the three points were ours for only the second time this season a late cross came in and Werner, who is less than 6 feet tall, was left free in the box to head home. Up next are Wolfsburg away, a tough game but not impossible considering their recent struggles. Werner after he made it 2-2. Volland is really taking control of games and is showing himself as a leader on the pitch. Vargas’ performances in the last few games – involved in both goals in this game and set up 2 in his last 3 before this. Volland, Vargas and Schmid are now clearly first choice and gelling well together. Yet another late goal – 5th this season conceded in the last 5 minutes of either the first or second half. First goal from corner was preventable. Unable to grind out the win against a struggling Stuttgart team. All images courtesy of kicker.de. Finally! Our first win of the season couldn’t have come quick enough and it was mainly thanks to a man of the match performance from Kevin Volland that we walked away with the three points. The first chance of the game also happened to be our first goal after Eduardo Vargas fed Volland on the edge of the box and he performed his customary move to cut inside and fire just inside the post past a helpless Marvin Hitz. This arguably came against the run of play but they struggled to finish off any of their early opportunities. Volland & Co. celebrate opener. Just before the half-hour mark however they should’ve equalised thanks to poor marking from our defence. A cross came in and Ermin Bicakcic was caught ball watching allowing Halil Altintop to free himself just outside the six-yard box only to hit the crossbar with his header. They got what was probably a deserved equaliser in the 38th minute thanks to a goalkeeping error from Oliver Baumann. He attempted to block a low cross with his leg only for the ball to bounce off his outstretched limb and straight onto the head of Ja-Cheol Koo. The reaction of Niklas Süle tells you everything you need to know about Baumann’s error. They continued to edge the game in terms of possession and shots in the second half but we managed to hold on and mid-way through the second period Vargas was brought down in the box allowing Volland to score his first ever Bundesliga penalty. After leading 4 games already this season yet going on to lose all four, I was holding back on the celebrations but five mintes later Volland combined with Jonathan Schmid down the left-hand side allowing the Frenchman to slide the ball home and make it 3-1 and wrap up the points. Schmid wraps up the points. First win of the season came away from home, had to wait until after the winter break for an away victory last season. We won despite being second best for most of the game. Volland finally seems to be stepping out of Firmino’s shadow. Augsburg created multiple chances and we were lucky that their finishing was poor. Baumann’s error is not his first this season and he needs to work on his concentration. Showed a tendency to ball-watch when the cross or set-piece was coming in. After what was by far our worst performance last week against Mainz last Friday I was extremely concerned that our next opponents would be the all-conquering Dortmund. I was expecting a humbling result so I was shocked that at the end of the game I felt like we could’ve easily won it. Fabian Schär was dropped, and rightfully so in my opinion, for this game as Ermin Bicakcic came in. Schär’s occasionally nonchalant defending had cost us goals in the last few games. The first chance of note fell to Dortmund as a low cross came in for Pierre-Emerick Aubameyang but just as he went to shoot Bicakcic diverted the ball away for a corner. Our opening effort came when Kevin Volland’s deflected cross was spilt by Roman Bürki but he recovered quickly enough to deny Eduardo Vargas the goal on the rebound. A quick free kick from Dortmund saw Aubameyang head onto the roof of the net before we had a great counter attacking opportunity after Volland managed to squirm past two defenders before going alone when he should’ve passed to set up Sebastian Rudy or Vargas. Unlike most of our games so far this season where we’ve conceded on the verge of half-time, we were the ones who scored. Vargas held the ball up before releasing it to the overlapping Rudy and he produced a lovely finish across goal and the ball went in off the post. Rudy and Vargas celebrate the opener. We nearly got a second straight after the restart when Matthias Ginter’s backpass was short allowing Vargas to steal in. He attempted to chip the keeper on the turn and was extremely unlucky to see his effort strike the upright but in hindsight he maybe should’ve passed to Jonathan Schmid who was right behind him but was facing the goal. Gisdol sent to the stands accompanied by stadium announcer Mike Diehl. We were made to pay for that miss almost immediately when a chipped ball into the box was chested down by Gonzalo Castro when everyone, including me, expected him to shoot allowing Aubameyang to equalise. We struggled to create anything after that whilst Dortmund were denied on several occasions by good defending, a couple of good saves and a large chunk of luck on our part right at the death. The cross came in low for Adrian Ramos but he completely mistimed his shot and the ball didn’t even go near the goal. Aubameyang slides in to make it 1-1. First team to stop Dortmund from winning. Created lots of opportunities compared to previous games. Bicakcic played well after coming in for Schär. Yet another lead we weren’t able to hold on to. Defence fell asleep for the Dortmund goal. Occasionally greedy in attacking positions. This is the first edition of a new feature on the blog that will provide monthly reviews on the players TSG have out on loan. As some countries start their seasons from mid-July onwards I have included the July games in this report. Haberer has been probably the most successful of the TSG loanees. He started all five of Bochum’s league games and with two goals and three assists he helped fire them to the top of the table in the German 2nd division. His very first game for Bochum saw the young striker score the winner away to recently relegated Paderborn. His second goal came in a 2-1 home win against Bavarian side FC Nürnberg. Haberer celebrates his first goal for Bochum. Image Credit donaukurier.de. Another solid start for a TSG loanee, he has gone straight into the ‘Lilywhites’ starting eleven and played all 6 games for the club keeping 1 clean sheet. The only times he has conceded more than one goal was against Holstein Kiel and against big spending RB Leipzig in the DFB Pokal. 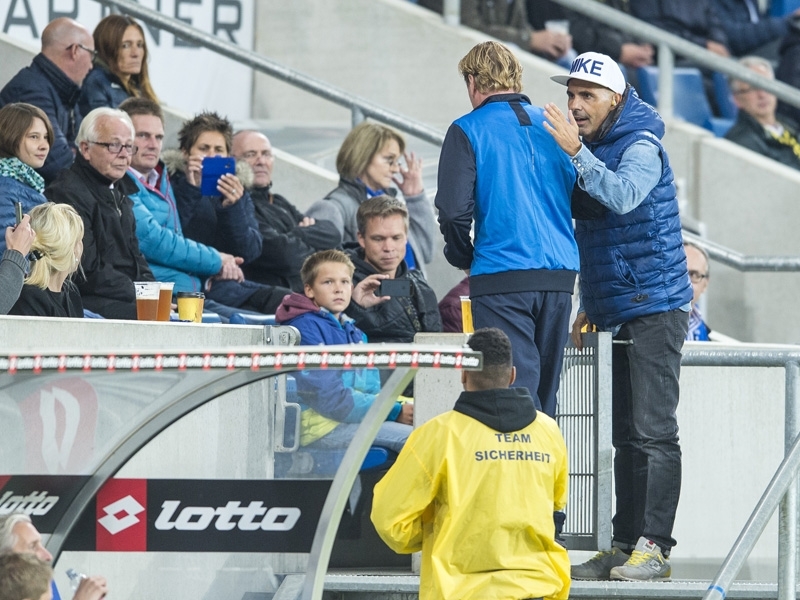 However, Schwäbe didn’t actually “concede” against Leipzig, the game was abandoned at 1-0 to Osnabrück after the referee was struck with an object thrown from the crowd and the DFB later awarded Leipzig a 2-0 victory. Osnabrück currently sit 9th with eleven points on the board. A mixed opening for Akpoguma’s two-year loan spell. He played the whole 90 minutes in the first game of the season, a draw against Union Berlin, and started the next game game against SC Paderborn, a 2-1 home defeat. He was brought off in the 84th minute and ever since was named on the bench. Antonio Colak (FC Kaiserslautern) – 1 start and 2 substitute appearances has limited Colak’s influence but with the side currently sitting in 9th when they were expected to challenge for promotion he will hopefully get more opportunities. In-Hyeok Park (FSV Frankfurt) – Park has only seen 18 minutes of action so far this season and it remains to be seen whether that will increases in the coming weeks. Felipe Pires (FSV Frankfurt) – Another player on loan at FSV and despite only moving there on the 25th of August went straight into the starting line up against St. Pauli, a game that ended 1-0 to FSV. Marko Maric (Lechia Gdansk) – Maric started all 8 games in the time frame covered but he is in a struggling Gdansk side who have conceded 9 goals and as a result lie in 13th out of 16. Christoph Martschinko (Austria Wien) – Another who has featured in all his side’s games and has helped his side to 2nd in the table. Joshua Mees signed for SC Freiburg on the 31st August so has not been included in this list. After the Bayern game I mentioned that the next three games, Darmstadt and Mainz away and Werder at home, were all winnable and it would be the opportunity we needed to kick start the season after two narrow defeats to quality sides. However, after two of these three winnable games we have come out with only one point. I have to confess that I didn’t see this game live but from what I’ve seen from various highlight videos and heard from people who were there is that we were awful in the first half. They had numerous chances from set-pieces which they were unable to convert and their goal was so frustrating to watch from a Hoffenheim fan’s point of view. Theodor Gebre Selassie fired the ball across the right-hand side and it should’ve been easily cleared by Fabian Schär, who up until this point had started the season well. Instead he attempted to pull off a ridiculous clearance where he tried to back heel it away, something only Niklas Süle could pull off. The ball fell to Anthony Ujah and he set up Zlatko Junuzovic for the finish. The fact that it came in the 44th minute made it even more annoying. It means that in the 3 of our 4 games this season has seen the opposition score in the last five minutes of the first half. Clearly this is a problem that needs addressing. Cue half-time and two substitutions from Markus Gisdol, Steven Zuber and Kevin Kuranyi off with Jonathan Schmid and Eduardo Vargas coming on. Both helped to drastically improve the team performance and as a result we were much better in the second half. Four minutes into the second half we were level thanks to a perfect through ball from Mark Uth, who has impressed me more than Kuranyi so far, which allowed Vargas to slide in and get his first TSG goal. Vargas scores, hopefully we’ll see a lot more of this. We went on to dominate the second period of the game but couldn’t take the lead despite multiple chances. As a result of our poor finishing we were punished. 47 seconds into added on time they pulled off a quick counter-attack and when Claudio Pizarro found Ujah in the box in space the Nigerian finished, it was yet another late goal conceded. Schär again has to learn from his mistakes. He had Ujah marked when Pizarro got the ball but he let the striker stray from him allowing Pizarro to find Ujah who finished comfortably. As for Junuzovic’s second goal all that can be said is that Oliver Baumann should never have beaten at his near post from such a tight angle. Werder celebrate their third goal. Schmid and Vargas made a big difference after coming on. From what I saw Mark Uth once again looked promising. All three came very late in their respective halves. Nothing created in the first half. So it was my one game of the season where I would be in attendance and I was hoping for a comfortable victory against a newly promoted side but, sadly, it was not to be. A frustrating game saw us fluff multiple game-winning chances that nearly cost us all the points at the death. 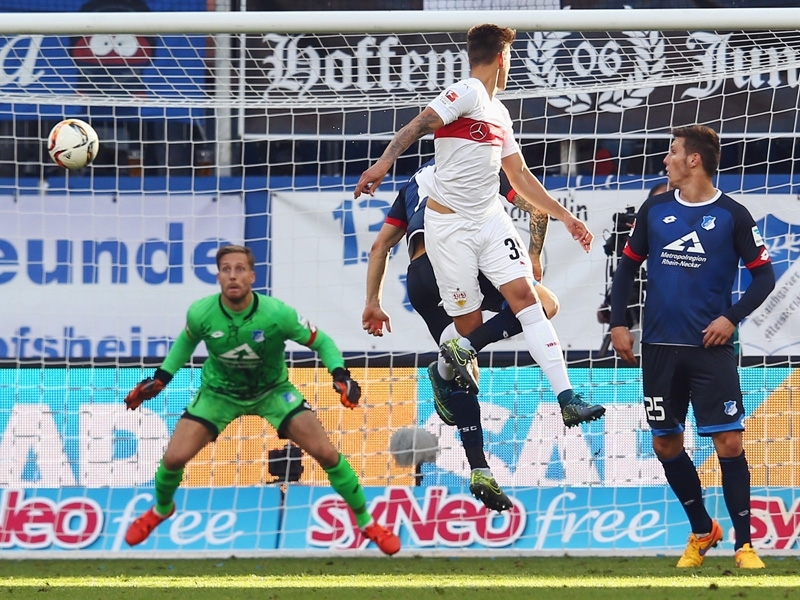 The game saw the first time this season that we started with two strikers, Kevin Kuranyi and Mark Uth. Admittedly Uth spent most of his time on the wing or behind him rather than alongside but at least it was positive thinking. From the beginning it was clear to see what the TSG game plan was; the fullbacks would push forward with the centre-backs splitting and Pirmin Schwegler would drop in between. Everyone else bar Eugen Polanski pushed forward meaning the Polish midfielder was the only one in the vicinity of the centre circle. This meant if Darmstadt covered Eugen then the defenders were forced to hit it long for Kuranyi and whilst he won most of the contests when it came to heading the follow-ups were cleaned up by the opposition defence. Our best chance of the half fell to Uth who fired just wide. Their best chance fell to Konstantin Rausch who could only hit it wildly over. Kuranyi in one of his many aerial duels. The second half was much better in terms of creativity. Steven Zuber put a free-kick over the bar early on before Gisdol made some changes bringing on Jonathan Schmid and new signing Eduardo Vargas but in truth they made little difference to what was a poor team performance. One of our many wasted chances. By far our best chance came close to the end when the ball was pulled back to Kuranyi but he didn’t catch it cleanly and despite squirming under the keeper was cleared off the line. Their one and only shot on target came in added time when ex-TSG man Sandro Wagner spun in the box and produced a superb save from Baumann when it seemed destined for the top corner. Gained first point of the season, we sit in 14th at the close of Match Day 3. Defence, especially Süle, once again looked solid. Pavel Kaderabek looked good going forward and assured when defending. Very wasteful passing from everyone. Lack of creativity in the final third.